Anonymous culprits cut gas pipes in southern Gilo neighborhood, in apparent attempt to cause an explosion. 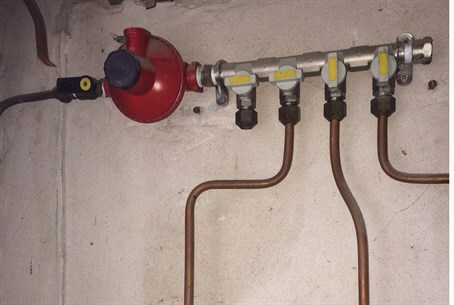 A firefighting crew summoned to an apartment building in the southern neighborhood of Gilo in Jerusalem on Wednesday discovered that a sharp odor of gas at the scene was due to a set of gas pipes that were cut, in an apparent terrorist attempt to cause an explosion. The crew was called by residents of the building who complained of a strong odor of leaking gas. Calls to the gas company yielded an order to close the gas taps inside homes until an inspection could be conducted. Firefighters used sophisticated sensing equipment to track down the location of the leak. Generally, such leaks are caused when a rubber seal or gasket breaks or gets old, but in this case, the firefighters found a metal pipe carrying gas from a central underground repository had been cut - apparently deliberately from the way the pipe appeared, firefighters said. Firefighters ordered all residents of the building to open all windows, in order to “air out” the building. After several hours, residents who had been asked to leave the building were allowed to return. Police are investigating to determine the circumstances of the incident, and have not ruled out anything, officials said. Overexposure to gas fumes could damage lungs, officials said, but a large amount of gas in the atmosphere could also enable a fire to spread very quickly, constituting a danger to life, they added.